No need to worry about airport transfers with this arrive-and-fly service. Meet and greet is perfect for those travelling with small children, running to a tight schedule or laden down with heavy bags. Start your trip in style with little jet-set luxury right here. No need for transfers, just take the short walk to the terminal. Your car will be parked in a compound that features a laser-beam security system, CCTV and 24-hour security patrols. 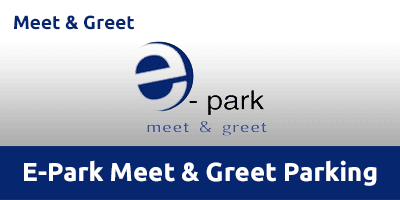 If you need any extra assistance then meet and greet with E-Park is ideal for you. This service operates throughout the year, 24 hours a day. Charges apply on exit, please see more information below for details. Due to strict airport regulations, drivers are not able to wait for longer than 10 minutes in the Priority Set Down area. Leave the motorway at Junction 10 and follow signs for the airport. Take the 2nd exit on the first roundabout then straight over the next. On the next roundabout, take the 3rd exit. Go under the bridge and take the fourth exit on the roundabout. Stay in the left hand lane to the short-term car park. Call E-Park 20-30 minutes before your arrival at the airport. After customs and baggage reclaim, call E-Park to let them know you’ve arrived. Collect your keys from the chauffeur and continue your journey.